My buddy Sal is smarter than me. When Sal and his wife were planning for Kid No. 2, they aimed for a mid-February delivery so the baby could be born between the Pro Bowl and March Madness (the single slowest stretch of the sports calendar). The Sports Gal and I did no such planning. In fact, I’m not even sure our second baby is mine. All I know is his early November due date forced me to stay home and miss every Fenway playoff game, the clinching game in Denver, the home opener for the rejuvenated Celtics and my 20-year high school reunion. Don’t think I won’t be reminding him about all this for the rest of his life. Although my son graciously waited until after the World Series to arrive, he inadvertently ruined my single favorite column to write every year: the annual two-part NBA Preview. I had just finished my pre-column preparation and sketched out every prediction when — boom! — somebody started having contractions. Frantically, I jotted down every prediction into a “Quickie NBA Preview” just so I’d have something on the record. But I still feel as though I owe you a 2007-08 NBA Preview, and honestly, I still feel like writing one. So here’s one man’s revised look at the Eastern Conference with added wisdom sprinkled in from the first two weeks of games. We’re posting half of the column Tuesday afternoon and the other half Wednesday — with the Western Conference on deck next week — so conceivably, you could say we’re headed for a Four-Part Retroactive NBA Preview here. Try to contain your excitement. No, seriously. The Bobcats actually aren’t terrible, which brings us to this season’s most important theme: The NBA hasn’t had this much overall talent since the early ’90s, and even then, the contenders could always rely on easy matchups with bottom-feeders such as the Clippers, Magic, Wolves, Hornets, Kings, Bullets and Heat. You couldn’t call any bottom-feeder “atrocious” or even “lousy” in 2007, so there won’t be any easy road games until injuries start piling up. Personally, I think we’re headed for a symmetrical season in which six or seven contenders (Boston, Detroit, San Antonio, Houston, Dallas, Phoenix and possibly Denver) finish somewhere above 50 wins, five or six teams (Charlotte, Washington, Philly, Minnesota, Seattle and possibly Memphis) settle somewhere below 30 wins, and everyone else settles into that 35- to 45-win range. Anyway, here’s my problem with the Bobcats: They have two high-lottery picks (Emeka Okafor and Ray Felton), two missing lottery picks (Sean May and Adam Morrison, both out for the season), one high-profile veteran acquisition (Jason Richardson, acquired this summer for the No. 8 pick), and $81 million worth of re-signed small forwards (Gerald Wallace and Matt Carroll). That’s their nucleus for now, and every move was defensible except for the absurd Carroll contract. Well, do you see a Go-To Guy anywhere in that group? Me neither. 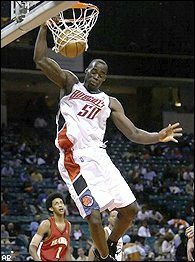 Trailing the Rockets by one Sunday night, the Bobcats isolated Wallace for their final possession against T-Mac. Even before the play unfolded, I was sitting there thinking, “All right, this has a zero percent chance of working.” Wallace drove right, got swallowed up by T-Mac, threw up an off-balance brick and got called for an offensive foul to boot. Get ready for about 15 moments like that this season, Bobcats fans. If you even exist. yet I like Jared Dudley more than all of them. Please, Lord, lemme have one billionaire reader buy an NBA team and make me a GM before I die. I don’t ask for much. NBA-TV should start a show like “Inside the Actor’s Studio,” only the guest could be an NBA general manager every week. Then we could hire someone like Rick Kamla to pick Billy King’s mind for an hour. “Billy, do you feel embarrassed that the Sixers are carrying nearly $30 million in dead salaries this season? Are you trying to break the record for ‘most raw athletes playing the swingman position on a single team?’ Instead of giving Sam Dalembert $60 million, did you consider just withdrawing $60 million from the bank and lighting it on fire? On a scale of one to 10, how excited are you to eventually offer Andre Iguodala $20 million more than he’s worth? What was the point of trading Steven Hunter’s semi-awful contract for Reggie Evans’ even-more-awful contract when the Sixers were going nowhere to begin with? Do you feel a sense of pride that you’re the only person on the planet except for Willie Green’s mother who thought Willie Green was worth $3 million per season? How do you expect Sixers fans to be excited about $15 million in cap space this summer when you’re the one spending that cap space? Wait, Billy, where are you going? Reason No. 12,745 why I love the NBA: Using ESPN.com’s Trade Machine to make up useful trades that will never happen because it’s the No Balls Association. 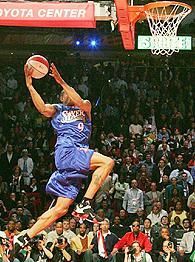 You know, like this one: Philly sends Andre Miller to Atlanta for Acie Law IV, Shelden Williams, Anthony Johnson’s expiring deal and the right to swap No. 1 picks once during any draft from 2009 to 2015 (top-10 protected). The Sixers would save $2 million (actually, $4 million when you factor in luxury tax savings) and smartly bottom out with young players for the Derrick Rose/Michael Beasley Lottery, while the Hawks would become a top-five team in the East as long as Josh Smith stays sane between now and April. Of course, the odds of Billy King and Billy Knight pulling off a sensical trade are about the same as those of Michael Richards hosting the BET Awards. 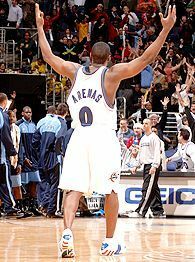 I picked the Wizards to miss the playoffs for three reasons: Gilbert Arenas’ lingering knee problems, an improved Eastern Conference and contract years for two of their top three (Arenas and Antawn Jamison). You know what happens when two of the three best guys on a struggling team are in contract years? Everyone starts gunning for his own stats, and the situation turns nastier than the first 30 minutes of “Eddie” right before Whoopi Goldberg took over. And even then, you might be able to get away with some selfishness as long as everyone’s playing defense, but the Wiz have been abysmal defensively for three years and counting. So what’s left? Why does anyone think this is a playoff team? If the Wizards keep losing, Gilbert will take a pounding from the purists for the wrong reasons (he’s too candid and too much of a self-promoter) and not the right ones (he doesn’t play defense or make his teammates better). I always judge players by one simple question: Would I want to play with them? And I’d be miserable playing with Arenas. He could still save the Wizards’ season by either (A) moving to shooting guard and becoming a pure scorer, or (B) getting his teammates involved at the expense of his own scoring (something he did in the victory over Atlanta on Sunday). But that’s the frustrating thing about Gilbert: He wants to play point guard, and he wants to score 35 points a game. You can’t do both. True point guards such as Steve Nash and Chris Paul understand instinctively how to sacrifice their own scoring to get everyone else involved, then look for their own offense only if their teams need it. Gilbert seems to get this sometimes; other times, he just says “screw it” and goes for himself. And that doesn’t work if you’re trying to win a title. We have 51 seasons of evidence to back this up. 1. Their big guys (Andrew Bogut, Chairman Yi, Dan Gadzuric, Charlie Villanueva) would be better off playing under FIBA rules — all of them are finesse guys; none of them commands a double-team; and if Dwight Howard ever puts up a 30-30 this season, it’s going to happen against the Bucks. The weird thing is I like each of those guys separately, just not together. Even on paper, it’s a weird mix — you have an Australian guy, a Chinese guy, a Dutch guy and Villanueva. I’d rather see these guys living in the same reality-TV house than trying to defend Chris Kaman. 2. They have too many shooters and no bangers or slashers, which means nobody ever gets to the charity stripe, which means they’re never fouling anyone out or shooting the penalty at the end of quarters. Every two or three weeks, they’ll shoot the lights out and run someone off the floor (like when they shot 60 percent to crush Toronto last week). But if those shots aren’t falling? They’re toast. We’ve already seen them get blown out by Orlando, San Antonio and Houston. If you’re a gambler, you might want to skip betting on the Bucks this season — it’s impossible to predict when those jumpers are going to fall, so don’t even try. although maybe the ruthless Sonics owners didn’t want it to be saved, and maybe that’s why they picked Jeff Green over a much more marketable Durant-Yi combo. Regardless, Yi looks as though he’ll be better than Brad Lohaus, although we should revisit this conversation in February after he has been dunked on 20 times. Reason No. 12,349 why I love the NBA: In honor of Friday night’s historic Yi-Yao matchup, I successfully convinced the Sports Gal to order Chinese food and watched the first quarter while eating General Tso’s chicken. There’s not much difference between No. 11 and No. 3 on this list — the next nine teams range from “half-decent” to “pretty good.” If you catch any of them on the right night, they might even look like a 50-win team. 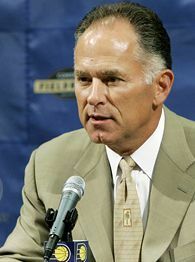 Anyway, I thought Indy would make the playoffs because of Jim O’Brien, an underrated coach who worked a borderline miracle with the ’02 and ’03 Celtics. Any Boston fan knew Obie would get the Pacers shooting a ton of 3s, playing defense and having fun again, but there’s one difference between those teams and this particular Pacers team: Obie’s key Boston players (Pierce and Walker) never missed a game, but his key Indiana players (Jamaal Tinsley and Jermaine O’Neal) have a habit of missing 20-30 percent of the season every year, and the Pacers already lost Ike Diogu and Marquis Daniels for a few weeks right as they were coming on. Bad omen. You can’t predict what will happen with the Pacers unless you’re betting the “over” for their games. You know, if gambling were legal. Reason No. 12,351 why I love the NBA: Somehow, Tinsley’s untradable contract still has four years and $28 million remaining on it. I think he signed that thing in 1987. Reason No. 12,352 why I love the NBA: All the teams that stupidly passed on Danny Granger three summers ago, which was moronic at the time (check out my 2005 draft diary) and seems 10 times dumber now that he’s lighting it up under Obie. Anyway, I heard a great story once about Larry Bird discussing a 2005 draft-day trade with another GM in which the Pacers would have traded down from No. 17, but when the Raptors took Joey Graham at No. 16, Bird squealed in delight and screamed, “I gotta go; we’re gonna get Danny Granger!” Then he hung up on the guy. 1. At this point, they’re loaded enough from drafting in the top-five for 13 straight years that three friends e-mailed me during Friday’s game just to say, “Thank God they didn’t take Chris Paul; that team would be freaking scary.” Every visiting announcer should be required by law to make this statement during a 2008 Hawks game. 2. Josh Smith has evolved into a southpaw version of Andrei Kirilenko — he fills up stat sheets, he’s exciting to watch in person, he lives off those weakside blocks, he’s moody and hard to read, and it’s unclear whether his team would be better off keeping him or trading him. The only difference is Smith scores more than Kirilenko, which is strange because he’s one of those guys who only scores on dunks and tip-ins. Other than that, they’re the same guy. And, yes, I’m aware I just broke the unwritten rule that you’re not allowed to compare white guys and black guys. 3. Al Horford is really good. (Not a huge shocker to anyone who watched college hoops last year, but still, it’s always a relief to know a ballyhooed prospect is definitely for real.) If you remember, the Hawks would have lost that pick to Phoenix if they hadn’t climbed into the top three May 22. As far as all-or-nothing scenarios go, that doesn’t come close to Memphis missing LeBron by one pick and getting nothing instead — actually, nothing in sports history compares to that moment — but it’s definitely on the second level. 4. 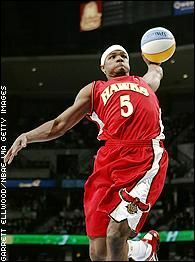 So Joe Johnson leaves Phoenix to sign with Atlanta for $70 million so he could be The Guy. Two years later, he complains that it might be time for him to leave unless they can find him some veteran help. Um, Joe? YOU LEFT STEVE NASH!!!!!!! YOU CHOSE TO LEAVE A PLAYOFF CONTENDER!!!! NOW YOU WANT VETERAN HELP???? Reason No. 12,353 why I love the NBA: The previous paragraph. If you watched the Nuggets-Knicks game Nov. 6, you would have thought the Knicks were headed to the Finals. MSG was rocking like it hasn’t rocked since the late ’90s. Zach Randolph and Eddy Curry were punishing Denver down low like two gigantic convicts bowling people over in one of those 10-on-10 prison yard games. 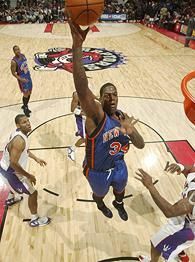 Renaldo Balkman was looking like a poor man’s Rodman hounding ‘Melo and igniting the crowd. (With Balkman, David Lee and Nate Robinson, the Knicks have the best six-seven-eight bench guys in the league, and nobody else is even close. All three of those guys can change the pace of a game and play crunch time.) Jamal Crawford had it going, which happens maybe two out of five games, but when it happens, look out. Best of all, Isiah Thomas and George Karl both played eight guys and that’s it, one of those throwdown, your-best-against-my-best games right out of the ’80s. I loved it. So what happened? They got the next two days off, blew a home game to Orlando in which Howard outrebounded Curry by a 20-3 margin, then choked at home against Miami, thanks to a historically bad crunch-time performance by Stephon Marbury. Cancel those playoff plans! I’d say the Knicks are headed for an unpredictable season, as evidenced by recent rumors of a Marbury buyout after he reportedly went AWOL for Tuesday’s practice. We might need to work Kathleen Decker in as the new MSG sideline reporter just to push it over the top. and $83 million for everyone else. Reason No. 12,355 why I love the NBA: The team’s buyout of Dan Dickau saved New York about $4 million this season. Only $200 million to go! We’re almost there! Reason No. 12,356 why I love the NBA: The Curry-Randolph combo marks the first time in NBA or WNBA history that a team has started two C-cups at the same time. Check back for Part 2 on Wednesday.